There is a new club at the Heavenly Hippos Wildlife Park – The Black and White Club. Anyone can join, as long as they are black and white. Or black. Or white. The penguins, zebras, skunks and other black and/or white animals get together for a fantastic party including some thrilling games of dominoes, but none of that helps poor George the Giraffe. He isn’t black or white and he can’t join in the fun. After several attempts to sneak in to the Black and White meetings, George decides to start his own club. The Yellow and Brown Spots club doesn’t draw too many members, but then George hits on the perfect idea: The Tall and Short Club. Author Alice Hemming’s story is all about joining in and having fun. George is disappointed to not qualify for the Black and White Club, but he quickly finds a way to create a more inclusive group of his own rather than pouting and sulking. The illustrations by Kimberley Scott are fun and colourful, featuring a nice variety of very social wild animals. 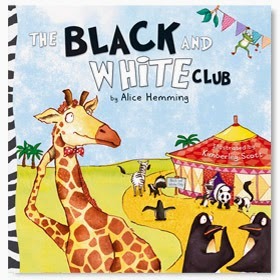 The Black and White Club is a fun picture book ideal for young children learning about different zoo animals and descriptive words, especially colours and size. It could also be used at home and in the preschool classroom to spark conversation about including others and how it feels to be excluded from groups and activities.